Background: The thumb plays a critical role for manual tasks during the activities of daily life and the incidence of neurological or musculoskeletal disorders affecting the voluntary movements of the thumb is high in the elderly. There is currently no tool to assess repetitive motor sequencing of the thumb during ageing. Objectives: To report a novel procedure (the Click Test) assessing the effects of ageing on fast motor sequencing of the thumb. Method: Healthy subjects (n = 252; mean age +/- SD: 49.76 +/- 19.97 years; range: 19-89 years; F/M: 151/101) were asked to perform fast repeated flexion/extension movements of the thumb using a mechanical counter. 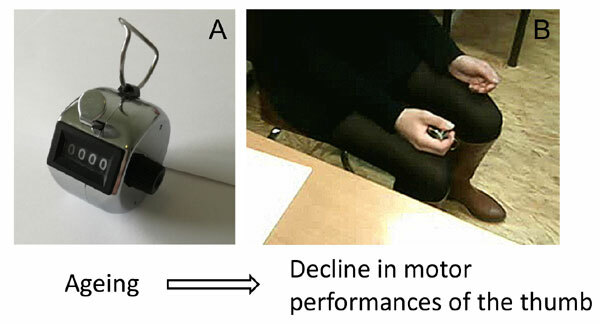 Results: Motor performances (assessed by the number of clicks during 3 time periods: 15, 30 and 45 sec), significantly decreased as a function of age for both the dominant (age effect; p< 0.0001 for 15, 30 and 45 sec) and the non-dominant hand (p<0.0001 for 15, 30 and 45 sec). The number of clicks was significantly higher in males (gender effect; p<0.001) and was higher on the dominant side as compared to the non-dominant side (handedness effect: p<0.001). The Click Test is characterized by high repeatability (coefficients of variation from 3.20 to 4.47%), excellent intra-rater reliability (intra-class coefficients ICC ranging from 0.89 to 0.98), high inter-rater reproducibility (Pearson’s product correlation ranging from 0.85 to 0.96), high internal consistency (Cronbach alpha coefficient=0.95) and is highly correlated in terms of relative performances with the box and block test and the 9-hole peg test (positive linear correlation with the results of the box and block test: p<0.001 for 15, 30 and 45 sec for both the dominant and the non-dominant hand; negative linear correlation with the results of the 9-hole peg test: p<0.001 for 15, 30 and 45 sec for both the dominant and the non-dominant hand). Conclusion: The Click Test is an entirely novel and very low cost tool to reliably discriminate the ageing effects upon the performances during fast repetitive motor sequencing of the thumb. The potential clinical and research applications for motor functions are multiple, especially in acute and chronic neurological disorders affecting the thumb as well as in the field of rheumatology and orthopedics. Keywords: Movements, sequencing, mechanical counter, hand, ageing, performances. Keywords:Movements, sequencing, mechanical counter, hand, ageing, performances. Abstract:Background: The thumb plays a critical role for manual tasks during the activities of daily life and the incidence of neurological or musculoskeletal disorders affecting the voluntary movements of the thumb is high in the elderly. There is currently no tool to assess repetitive motor sequencing of the thumb during ageing.